Please bring a unwrapped toy or suggested $5 donation. playing originals, remixes, and close relatives of Motown era classic soul, R&B, disco, boogie, etc. MOTOWN on MONDAYS: "Psychedelic Shack"
In celebration of everyone's favorite holiday and time of day, we're putting together a 420 theme night! DJs will be spinning loads of psychedelic Soul & Funk from the 60s & 70s. So much mind-bending music was born in this era and we'll touch on it all! We're also excited to welcome a special guest from our extended MoM Philly fam & founder of Record Breakin' Music, Junior! East Room is open 7 days a week from 8pm - 2am, 3am on Saturdays and shots of Paddy Irish Whiskey are always $3. Motown On Mondays (MOM) coming to Philly! DJ Junior & Lil' Dave are proud to bring Motown On Mondays to Philadelphia Fall 2014! What began in 2009 as a humble Monday night, Motown and Soul relatives party in San Francisco (Motown On Mondays) has since exploded into a weekly multi-city dance party across the States with family worldwide. MOM DJs & Events is a family of DJs, producers, musicians and music enthusiasts that all share a passion for the convergence of soul music and dancing. They perform at and produce weekly, monthly and special events across North America; including San Francisco, Los Angeles, Honolulu, Seattle, Chicago, New York, Miami and beyond. MOM DJs represent the most spirited soul parties with a unique vibration. We gather our musical inspiration from Motown, Soul, Funk and Disco with an emphasis on new and classic remixes/edits. Many of these remixes and edits are created from our family of 60+ DJs and producers worldwide. We are looking forward to heading down to Texas for the weekend to catch up with friends, play records at some great parties and of course eat some BBQ! 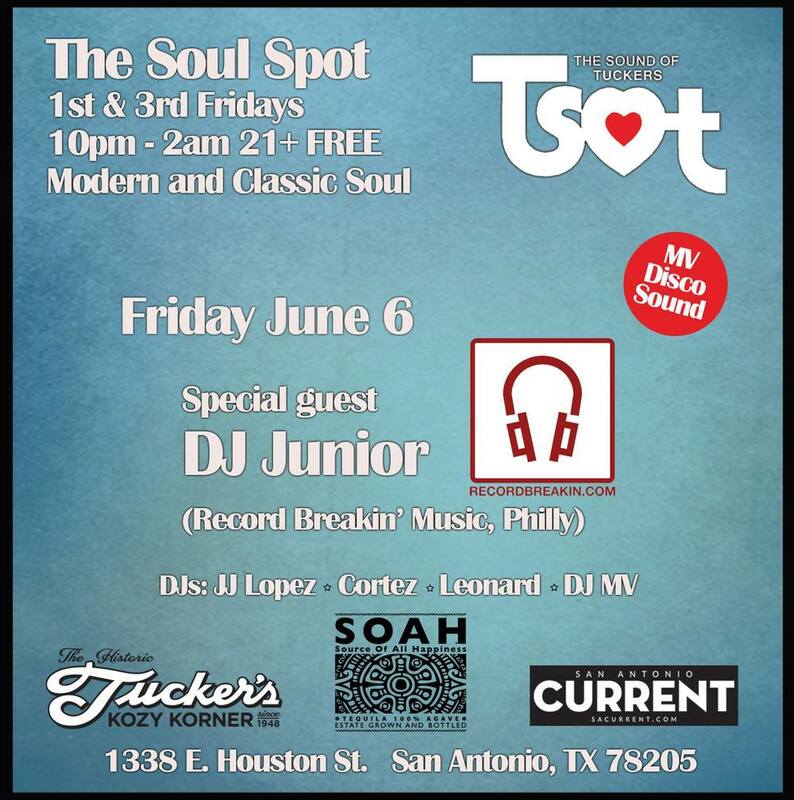 The Soul Spot at Tucker's Kozy Korner -- It's the Soul Spot back again with yet another exceptional summer night of serious FIRST FRIDAY Boogie Disco Funk Soul goodness. Returning from Philly and back in San Antonio for one night -- none other than Record Breakin' Music founder and host of Eavesdrop Radio DJ Junior. Joining the good Dr. is Soul Spot resident JJ Lopez and Cortez. We have the MV Disco Sound system in full effect, Tucker's Kozy Korner with Cullum's Attaboy handlin' the bar & grill, and plenty of open dance floor space to handle the First Friday dancers -- FREE 10PM-2AM 21+ Brought to you by: SOAH- Source Of All Happiness Tequila, San Antonio Current, and Tucker's Kozy Korner. Ladies and Gentlemen, friends & family, the one year mark is upon us, and what an amazing ride it has been! To show our gratitude to the great city of Austin, we've put an amazing day of music, food and drink for you. Join us this Saturday for our 1st Year Anniversary Bash. We will be roasting a 150lb pig on a spit, there will be craft beer flowing from our friends at Austin Beerworks, we'll have a live band in the early afternoon, Jean-Pierre and the Zydeco Angels (6-8pm), and follow that up with an awesome set with DJ Chicken George and DJ Junior. To keep it fresh, they'll be spinning vinyl from 9-12am. Don't know if we'll every be able to top this! I guess we'll have to find out when we reach year 2. See you Saturday! 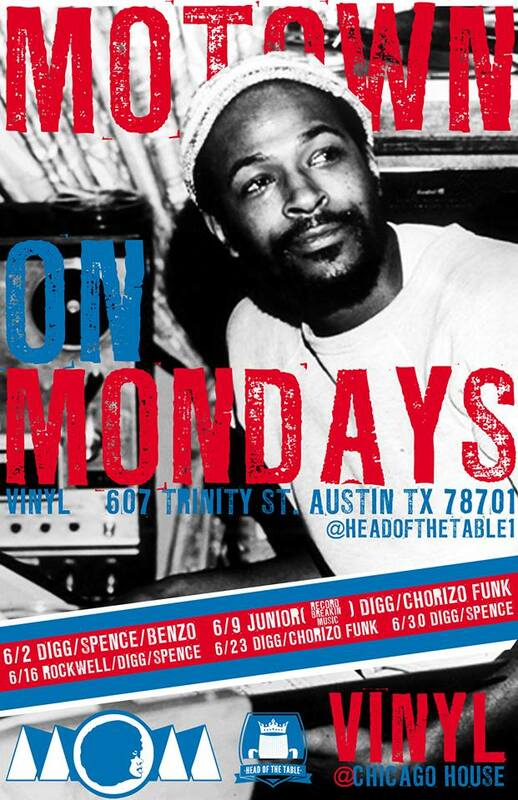 Austin's newest weekly soul dance party hosted by Chorizo Funk, DIGG & Spence is back ALL MONTH LONG with very special guests including this MONDAY June 9th featuring DJ Junior (Record Breakin' Music / Eavesdrop Radio, Philly)! What began as a humble Monday night Motown (and soul relatives) party in San Francisco (2009) has since exploded into a multi -city (SF, NYC, LA, HNL, DEN, OAK, CHI and AUSTIN!) Monday dance party across the states. Founder and resident DJ, Gordo Cabeza, and his partner DJ Timoteo Gigante, were inspired by the success of these events which led to our event production brand, MOM DJs & Events. With it's newest production member, The Captain Hat, we're bringing quality dance parties across the universe. This production brand places emphasis on quality of music and vibe over bottom line marketing. No matter where the party is we keep the spirits lifted and our hearts attuned! See you on the dance floor!